Costume Designer : Shabina Khan, Manish Malhotra, Rocky S.
Yashovardhan and Nandini Raichand (Amitabh and Jaya Bachchan), a wealthy couple are steeped in family values and traditions. Their two sons, Rahul (Shah Rukh Khan) and Rohan (Hrithik Roshan) share a warm relationship with each other and their parents. Yet, beneath the surface things are not what they seem. Rahul is an adopted child, who feels irrevocably tied to feelings of gratitude towards the couple who took in an orphan like him. 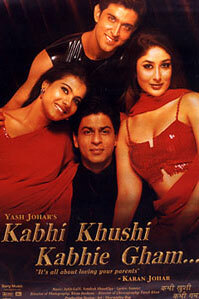 When he falls in love with Anjali (Kajol) a middle-class girl living with her sister Pooja (Kareena Kapoor) and dad (Alok Nath), Yashovardhan Raichand strongly disapproves. But for Nandini, love is the guiding force. Conflicts mar the serene atmosphere and a grief-stricken Rahul decides to leave home…..
Director Karan Johar has pulled off a casting coup, putting together the biggest names in Hindi cinema today. The film has been insured for a whopping Rs. 22 crores, again breaking a record. Another unique feature - it has 281 different trailers being shown all over the country and abroad. 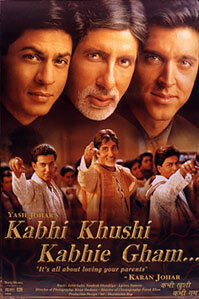 The melodious soundtrack from Jatin – Lalit includes ‘You Are My Soniya’ and the poignant title song ‘Kabhi Khushi Kabhie Gham’ and one more number sung by Amitabh. 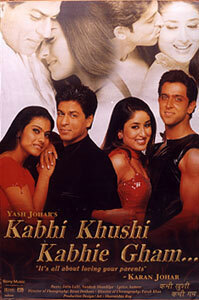 Racy choreography from Farah Khan for Hrithik promises to recreate the magic of Kaho Naa Pyaar Hai..